Aaron and Julie are delighted to announce the arrival of Ezra James, on May 9, 1998 (8lb 6oz). A brother for Nathan and Reuben. 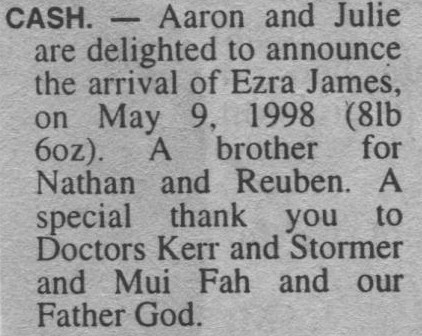 A special thank you to Doctors Kerr and Stormer and Mui Fah and our Father God.